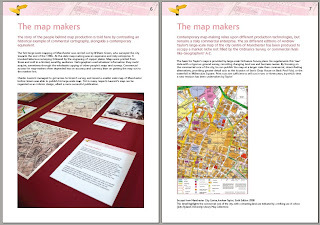 I have put up an initial web page to support the ongoing Mapping Manchester research. Its a bit of a holding page at the moment, basically providing links for the exhibition. I am working on a page of scans of maps and plans of the the Manchester Ship Canal from Bosdin Leech's 1907 book. A contemporary version of a 'drink map' for Manchester. 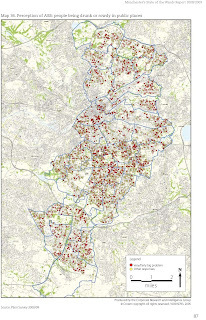 This one maps self-report points of public drunkenness and rowdy behaviour shown as red dots. However, I'm not sure there is any particular spatial pattern evident. The map is one of many presented in recent social analysis of the city in the State of the Wards Report 2008/2009 (warning - 20 meg pdf).